My cocktail curiosity was first aroused, I think, back in the Spring of 2007; more exactly, my 21st birthday. “Of course!” you might be thinking, “He went out and got bombed on shots of Jägermeister, Jack Daniels and cheap beer!” Well, no binge-drinking, beer-pong party pour moi. Instead, I headed past Tech Square and over to MidCity Café during a two-hour break from architecture studio. My friend, part-time bartender and fellow archi-student Lena had offered to buy me a drink. Sitting at the bar and hemming-and-hawing about what to order, I finally said, “I have no idea! Pick one for me!” The result? A Mango Martini, a mixture of Grey Goose Vodka, Triple Sec, and Mango, with a dash of Sprite. It inhabits their drinks menu to this day. “Pretty good!” is what I declared at the time. After downing the drink and munching on what I recall was a darn good Cuban Sandwich, I wandered back toward Studio Hell in a (very) slightly buzzed state, watching the sun set over West Campus, its last rays shining on the 5th Street Bridge. Not too bad a birthday dinner after all. I am not an enormous fan of vodka (someone may yet change my mind! ), as I think it’s just not that interesting, but it’s not without merit. Vodka takes on whatever flavor it’s combined with, can be used to temper bolder spirits (see The Vesper), and is key in numerous classics. I do enjoy Jason Wilson’s musings on Grey Goose, however. Gary Regan says that if they want to call drinks or cocktails “martinis,” let’em. I beg to differ, siding with cocktail historians on this one. (Death to Appletinis!) The history of the Martini is muddled, so to speak, but it’s important. “Mango?” In what form? Juice? Nectar? Mango-flavored Grey Goose? I don’t remember. I hope it was juice. And I hope that was a good triple-sec, too. The MidCity Mango is actually constructed as a classic Sour-Style drink (base spirit, sweetener, fruit/citrus), so it earns applause for that. The Martini turned out well: cold and silky smooth, thanks to the stirring (never shake a true Martini). This was the first chance I’ve had to crack open the Aviation Gin, a recent purchase from Mac’s. Excellent! Certainly less juniper-forward than most London Dry Gins: more floral, more herbal, not harsh at all, and, perhaps, slightly sweet? A gin you could drink straight. 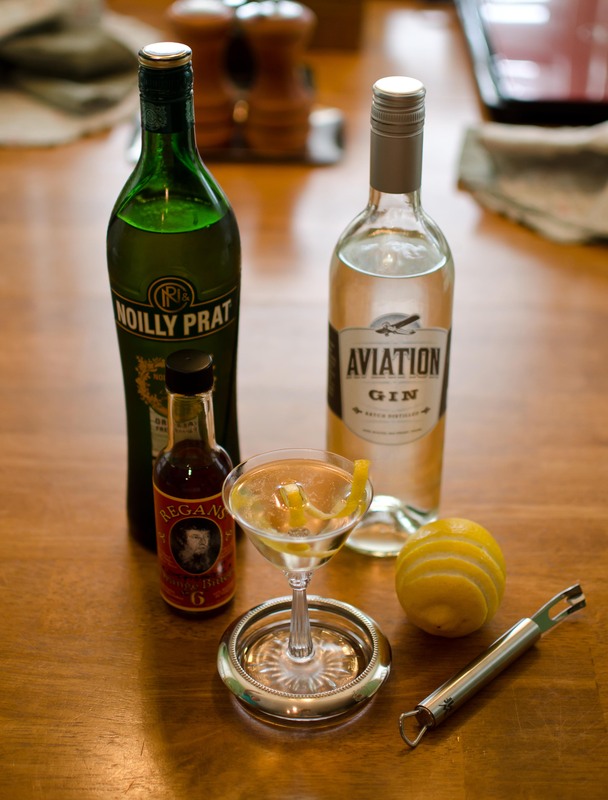 The Noilly Prat Original is my go-to dry vermouth, though I’d love to get my hands on some Dolin Blanc. The bitters? Regan’s Orange Bitters No. 6, my current favorite, as they’re less medicinal than Angostura’s orange and not as sweet as Fee’s. A lemon twist is preferred over olives (which I don’t particularly care for, anyway). A 3:1 Gin to Vermouth ratio may work very well here in future experiments. 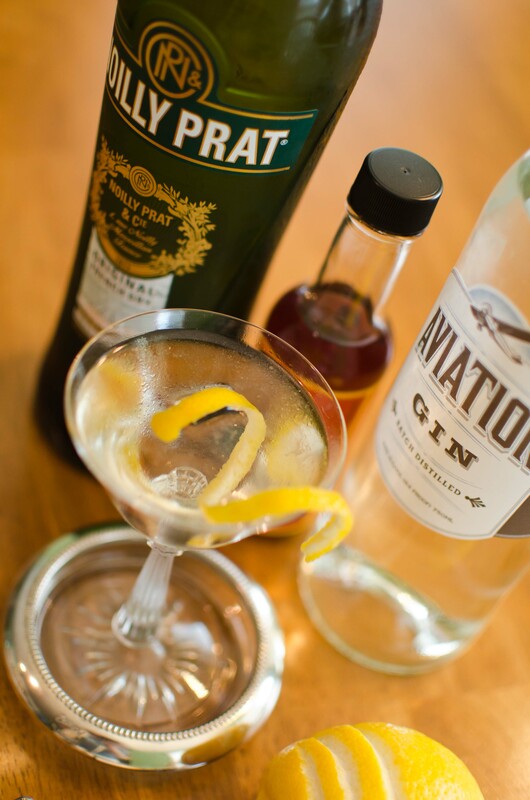 This entry was posted on June 26, 2011 by IJ Lauer in Drink Recipe, Dry Vermouth, Gin and tagged cocktail, dry vermouth, martini, recipe, vermouth.